An IDX Broker office account can have many agents that may need tracking and management. You can export a .csv (Comma Separated Values) file of these users for use in analysis and management software. To create a User export, log into IDX Broker and navigate to Account -> Users -> Exports. From there, click Create Export in the upper-right. 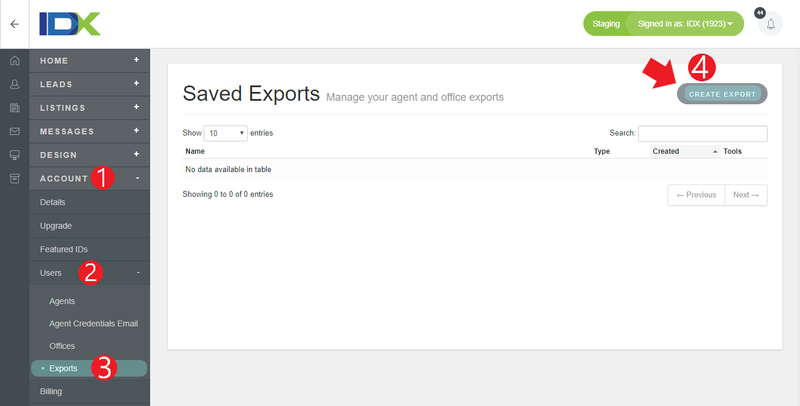 Now you can select if you want to export by office or agent. This export is completely customizable. Select all the fields that you would like in your report and then filter the results to return only the necessary data. When your criteria are set you may immediately export a CSV file, or save this export to perform later. While all office accounts have the ability to export the user list, and even save this export, retrieval of the saved exports is restricted to Platinum accounts. If you have a Platinum account, save exports of reports that you wish to run on a regular basis.